Suggested your scope of responsibilities includes replying to certain requests from customers or partners, or supervising interns dealing with correspondence, or finding relevant materials in the corporate mail flow for other purposes, you probably use Public Folders on your Exchange Server quite often. In essence and architecture, Public Folders in Exchange 2013 are very much resemblant to mailboxes with shared access. They are frequently used by workgroups or entire organizations as an efficient way of collecting, sharing and organizing information, including, above all, incoming correspondence. 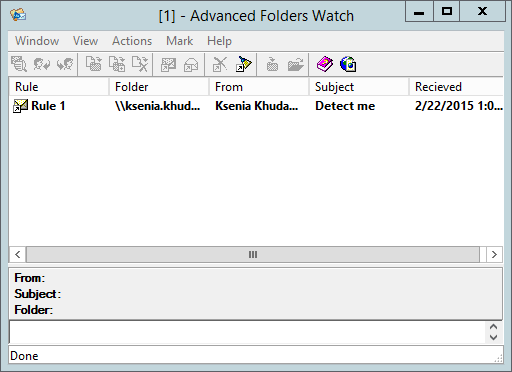 If a public folder has been mail-enabled and included in a distribution list, a copy of a message sent to this DL is added to the folder as well, so public folders can also be used for archiving purposes within a workgroup. 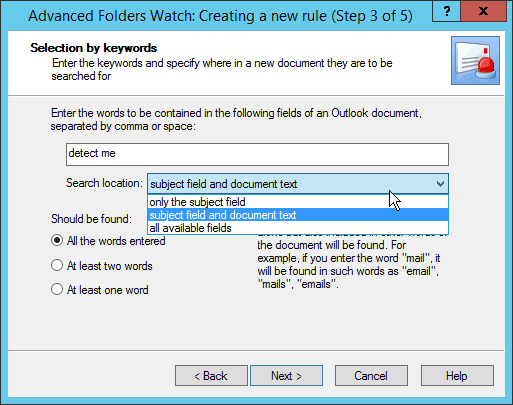 All you need in order to view and access items in a public folder is your Outlook client. Public folders are indispensable whenever there is a massive flow of information, for instance, messages from discussion forums, news conferences and other open resources, and a few employees who monitor this flow in order to find potential customers, offer the company’s products as a possible solution to a user’s problem, come up with ideas for new products and materials, and so on. Forwarding all messages from such resources to the mailboxes of every workgroup member is not an option in this case, as the number of messages can be huge, and very few can actually be relevant. So, in order to save disk space and decrease the load on resources, it makes sense to use one and the same folder for all correspondence of the kind and monitor it according to your working tasks. However, manual monitoring of a large public folder which is constantly updated is an extremely arduous task eating up plenty of time. What is more, some urgent or just important request from a potential or actual customer could be overlooked and left unanswered for weeks on end because of a faulty lookup query or plain negligence. When it comes to processing thousands messages on a daily basis, built-in Outlook monitoring devices are almost useless, because there are no filters and you can’t monitor subfolders, either. Therefore, it is a good idea to use a specialized tool to automate monitoring and make it more efficient. 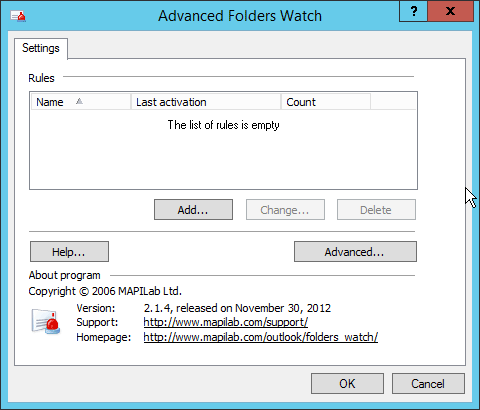 An Outlook plugin by MAPILab called Advanced Folders Watch could be just what you’re looking for. 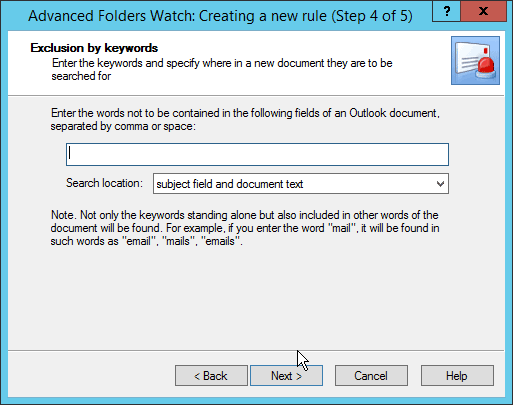 This Outlook add-in tracks changes in specified folders or subfolders and notifies the user if there are any new objects that meet certain criteria. It should be mentioned that AFW is the only way to get notifications when new messages appear in Public Folders on Microsoft Exchange. You can chose between passive and active notifications. If you opt for the former, Advanced Folders Watch will organize links to messages meeting the criteria into posts in a specific folder, which you can browse at your convenience. The latter includes real-time pop-up notifications that prompt you for actions to be applied to a detected document: view it, open on your endpoint, copy, or delete. The two methods can also complement each other to keep you on top of things both at work and on-the-go. Speaking of technical details, this add-in is available as a free download, and after installation you will find it under MAPILab Tab on the Ribbon. 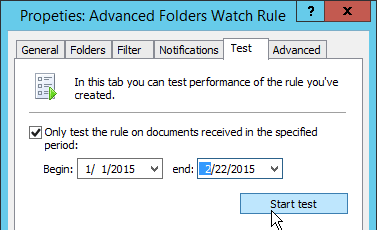 To start working with Advanced Folders Watch, go to settings first in order to configure one or multiple rules, which form the logical base for the add-in operation. You can create and manage an unlimited number of rules, so the overall flexibility is dazzling. 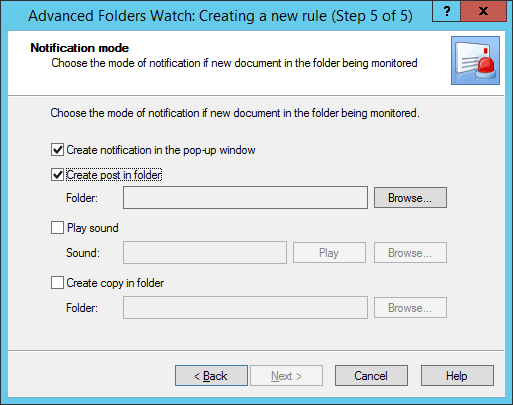 When you are setting a new rule, you are ushered through the process by a rather concise five-step Wizard: name, folders, selection and exclusion keywords, and preferred notifications mode. 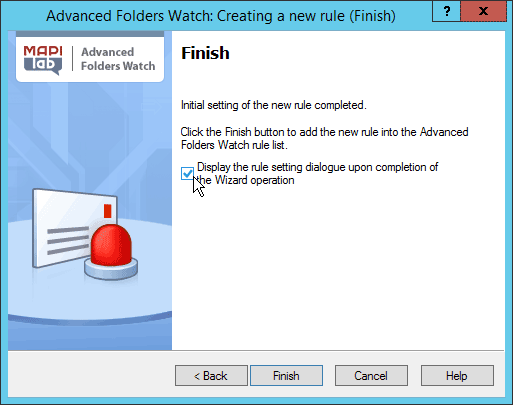 However, the rule setting dialogue that can be displayed after the completion of the Wizard offers a wider range of filters and properties. 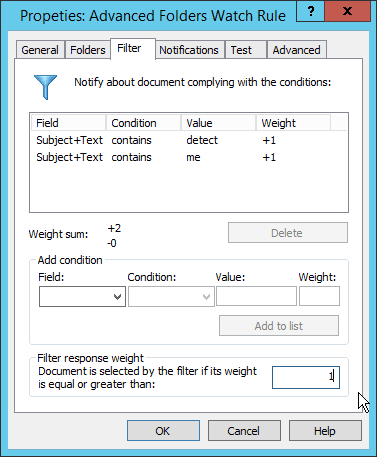 First and foremost, you get to fine-tune the filter by adding more values, assigning weight to them and setting the weight threshold for documents to be selected. Another feature worth your attention is the testing mode, which has two basic functions: checking if the rule actually works the way it should and processing existing message databases to find relevant information. You can set the rule to be tested on messages received within a specific period, for instance, one or two months. Moreover, you can safeguard the rule from possible errors by setting maximum response frequency per minute, and the rule will be automatically disabled if this value is exceeded. As an additional precaution, you can also exclude folders of certain types from monitoring, for example, ‘Inbox’ or ‘Sent Items’ folders. 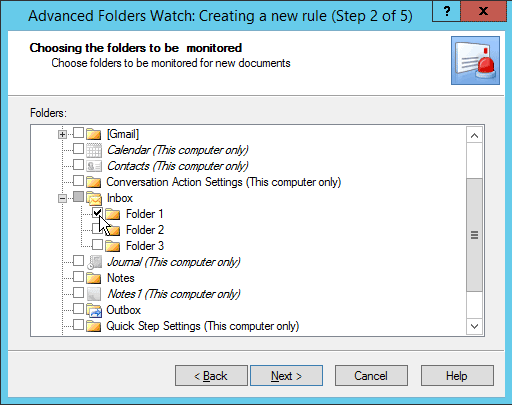 All in all, Advanced Folders Watch is a powerful and easy-to use solution for monitoring public folders on a Microsoft Exchange server, compact and seamlessly integrated in Outlook interface. This tool has all the chances to become your indispensable assistant and guide in the ever-growing sea of information to be processed and controlled.